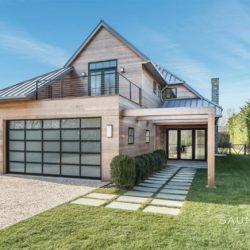 Experience transitional barn-style living in this new Farrell home in Sagaponack Village, which brings to the classic Hamptons home a suggestion of the farm fields. 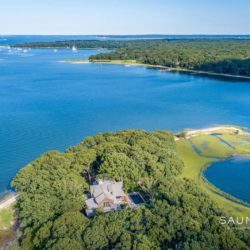 Situated on 1.37+/- acres, the furnished six bedroom, six and a half bath home, which provides 6,354+/- sq. ft. of living space (inclusive of the finished lower level) has all the amenities for fine Hamptons living. Open concept first floor interiors have lots of natural light and flow from the double-height foyer to the great room, living room with gas fireplace, custom eat-in kitchen and formal dining room. Upstairs is the gracious master suite, which features a private terrace and radiant-heated flooring in the beautiful bath. Four additional en-suite bedrooms are also on this level, along with a laundry room. In the finished lower level are a media room, sitting area, open recreational area and an additional bedroom and full bath. Outdoors enjoy generous covered entertaining space overlooking the 40′ heated gunite pool and spa. Additional amenities include attached two-car garage with radiant heated flooring, and prewired A/V. 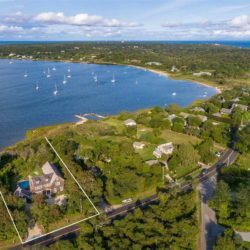 Centrally located between Bridgehampton and East Hampton this home is furnished and just minutes to the ocean.